This is 7th Avenue near 38th Street as depicted on a postcard dated 1911. 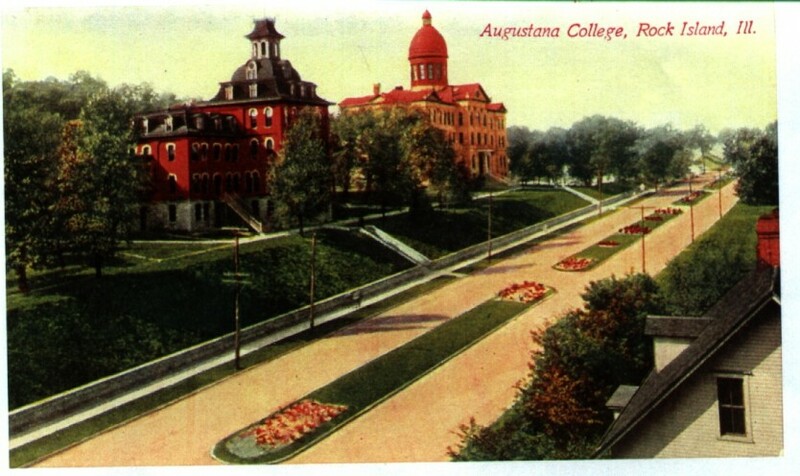 The building on the left was the first building of Augustana College. It was completed in time for the beginning of school in September, 1875. The cost was reported to be $43,000. The building housed the entire College program including classrooms, chapel, library and housing for students, faculty and even the college president. Augustana College was founded in 1860 in Chicago. It moved to Paxton, IL in 1863 but decided to relocate to Rock Island where the railroad and the Mississippi met . This location would better serve the Swedish immigrants who settled throughout the midwest. The College purchased a tract of partially wooded farmland located half way between the business districts of Rock Island and Moline. The land was not yet developed. The only street connecting Rock Island and Moline was 5th Avenue. But by the date of the postcard, 7th Avenue had become a major boulevard and Augustana College had grown to become a campus of buildings. Old Main, the building on the right, was designed by two architectural firms, Hallberg of Chicago and E.S. Hammatt of Rock Island. It took almost a decade to complete the impressive structure. The cornerstone was laid in 1884. The building was dedicated in 1889. The dome and portico were completed in 1893. During the years of construction city water and electricity were extended to the College and incorporated into the building. In 1888 most of the academic functions were transferred from the first college building to Old Main. The older building served as a dormitory until it was razed in 1935. Old Main stands today as the defining structure of Augustana College. It is listed on the National Register of Historic Places. More recently is is being extensively restored, with the exterior, notably the dome, completed in 2011. Work on the interior continues. This article by Linda Anderson, slightly modified, originally appeared in the Rock Island Argus and Moline Dispatch on July 1, 2001.